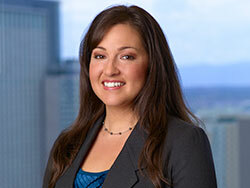 Julianna Wade originally joined Schlueter, Mahoney & Ross in 2000, and was with the firm until early 2005. After a brief time as a mortgage loan originator, Julianna returned to Schlueter, Mahoney & Ross in 2007. She has 15 years of experience in the legal field. Julianna is an integral part of our legal team. She is involved with document review and organization, trial preparation and assistance during trial including maintaining exhibits and witness coordination. Julianna communicates with clients, other attorneys and the court to coordinate meetings, depositions, hearings and trials, as well as maintain and monitor case files to make sure every client receives the best services possible from Schlueter, Mahoney & Ross.